Me Worry? | Are You Zhazha? I think I’m a pretty smart person. I realize worrying doesn’t get me anywhere. It doesn’t solve anything. It doesn’t change the outcome of things. It doesn’t prevent things from happening. Why then? Why all the worry? It’s such a waste of energy, time, sanity, happiness. It’s what I’ve been reminding myself when I feel the senseless anxiety bubbling up within me. But that’s also when I start worrying (of course) – if I don’t worry, does that mean I don’t care? I’m not sure I know how to care about something without worrying about it. If I let go of that worry, will it change how I care about it or make it seem like I don’t care? Ridiculous, I know. See what I mean about me worrying?! To quiet that inner loon, I’ve been trying a few things to help ease my mind and heart. They’ve been working for me so I wanted to share because they may help a worrier you know. I think of my kids. They see me worry too much. What am I teaching them? 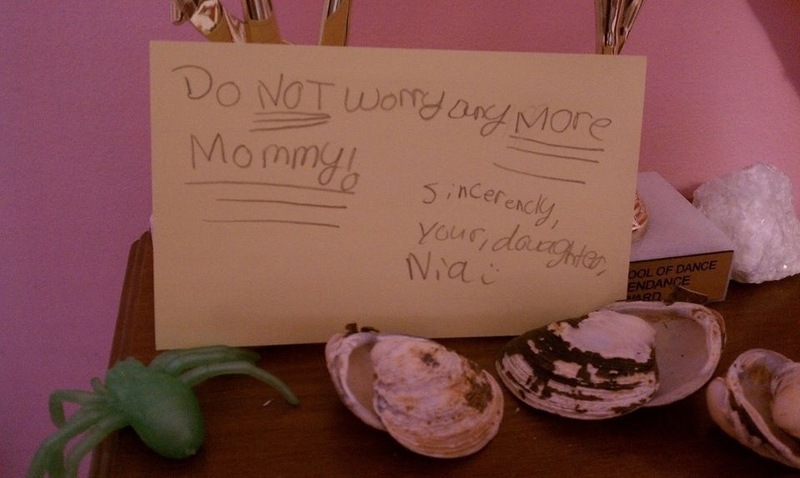 As Nia’s sweet note shows and I’ve written about, it makes her worry. If nothing else, it can’t be fun to always hear me say something worries me. That has to change. They need to be carefree kiddos. I think to myself, will this worry fix the issue? No? What will fix it? Anything? Focus on that. Is this going to matter next year? Next month? Next week? No? Toss it. Will this define me? In 15 years, am I going to remember this moment or issue? No? That was an easy one. Will this affect my family in some way? No? Not worth an ounce of stress. What happy, beautiful things am I missing out on around me because I’m stuck in the fret zone? Sucker. You are letting worry rob you of the present. The last point actually came from something recently talked about in church. I don’t always connect with what’s taught but this spoke to me. It was about how we are only supposed to think about we need for today. “Give us this day our daily bread” refers to that. This day. Focus on today, not tomorrow. Be content and full in the present because if it was my last day I wouldn’t want it spent on worrying about what might happen. I’d want it filled with rejoicing and cherishing. That’s what brings me to the thought that seems to soothe me the most. I think of my here and now and feel at peace. One of the ways I sort worry is by things that I can act on (you have a cold, I’m worried about you, I DO something and bring soup) versus when you are worried because someone is making decisions that are different than what you would do (I’m worried because she’s going on another date with him after I have decided he is a tool). The ones where other people are just doing things differently that I do … are easier for me to let go of once I name it. Love this idea. Putting a label on it will help me a lot. I’m a worrier. In fact, my husbands nickname for me is “worry-wart”. Real nice, huh? I should heed your suggestions! It’s a hard habit to break that’s for sure! From one worrier to another, I needed to read that! Thanks Nicole! Thank you for my email reminder about how to let something go! “to quiet the inner loon” is today’s Phrase That Pays! I also love nut job. Ha! I can see that happening! Worrying about not worrying.